The Digital Team visited our lovely clients in Huntingdon to photograph a special project that we completed earlier this summer which highlighted the versatility of our Cayman Roof Blind. 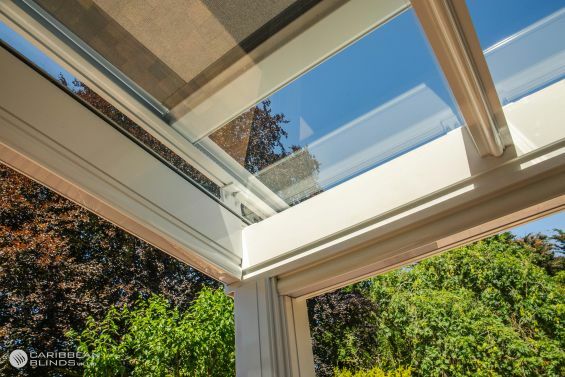 This wasn’t on your average skylight window, this was something more than that, we enhanced a Veranda and gave it the ability to provide the clients with more. Upon entry of the garden you were instantly greeted by a large Veranda that stretched across the client’s ever spacious patio area, this was obviously the dedicated outdoor living area where they spent most of their time which. The space underneath the Veranda was split into two areas, one half dressed with alfresco furniture and the other with a seating area to relax in. From looking at their garden design you could instantly tell these clients enjoyed their outdoor space which is why it was important for them to make their outdoor living area comfortable. The Veranda is designed with a glazed roof which can be a vulnerability when it comes up against the sun’s damaging UV rays. The glass can intensify the rays causing an unbearable heat underneath the space which is the last thing these clients want on a hot summer’s day. 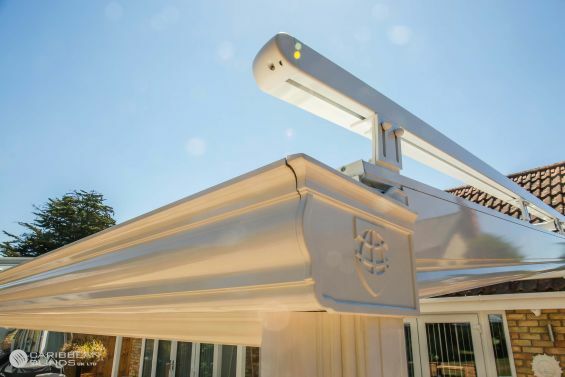 By applying an outdoor roof blind to the exterior of the glass we were able to create a first line of defence against any solar rays trying to penetrate through. 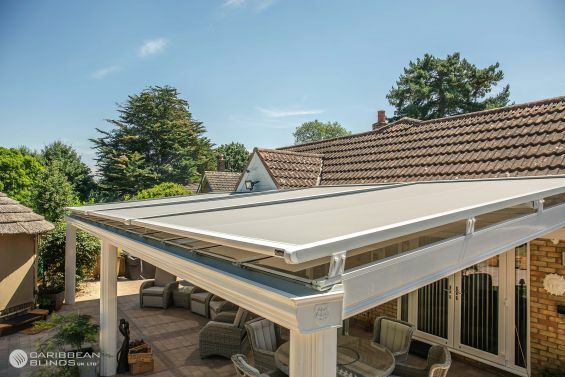 The weather-proof fabric has been designed with UV battling properties that will guarantee safety against the sun and keep the dedicated outdoor living space shaded, cool and free from glare. Our team of designers worked with the clients to create a bespoke External Shading System that would cover the large expanses of glass whilst maintaining an aesthetic appeal that would coincide with the existing Veranda. 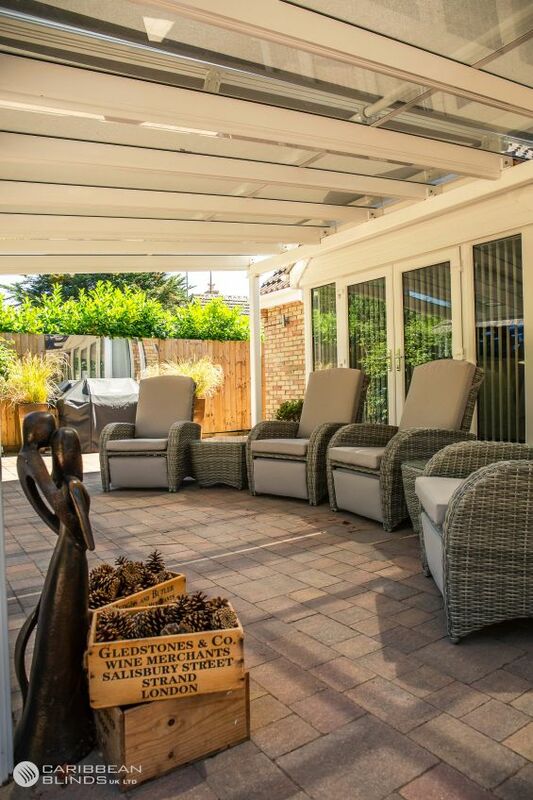 The hardware RAL colour was matched with the aluminium Veranda frame and the slate grey fabric to compliment the grey rattan furniture, from looking at the images it feels like the roof blind system has always been a part of the Veranda. At Caribbean Blinds one of our main priorities is to introduce a shading system that will alleviate solar heat gain issues and provide a healthy space for our clients to relax in. Our team of surveyors will be able to overcome most obstacles and find a solution that works for the clients. Talk to one of our advisers today and see how we can help you – 0344 800 1947 or alternatively you can leave your details using our quick enquiry form and we will send you a FREE inspirational product brochure.